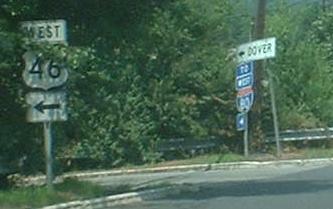 NJ 62 is an anomaly of a road. 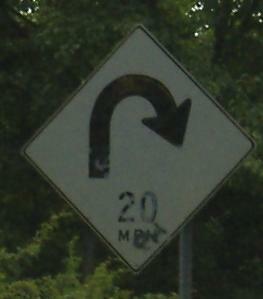 Unlike other NJ secret routes, this one was once signed, and much longer than it is now. 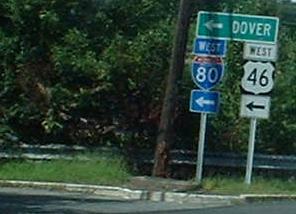 Instead of merely connecting US 46 and I-80, NJ S-6 spurred up from NJ 6 (US 46) well into Totowa. 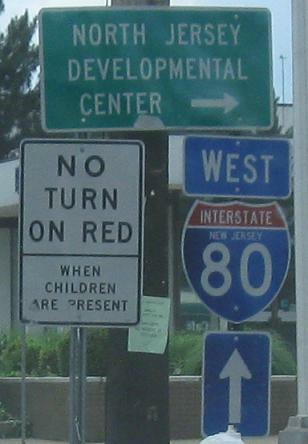 In 2000, NJ 62 was even dropped from the state straight line diagrams (SLD's), meaning that there was no official representation, even though the official state map still had a short red link on it (indicating state maintenance and thus a state route designation). 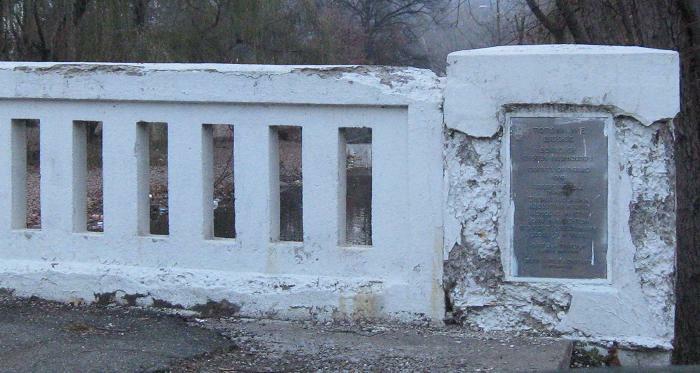 In 2001, the SLD entry was restored. The 2003 state map shows NJ 62 as a red link, and former NJ 62 as a thick black line all the way up to the Great Falls in Paterson. 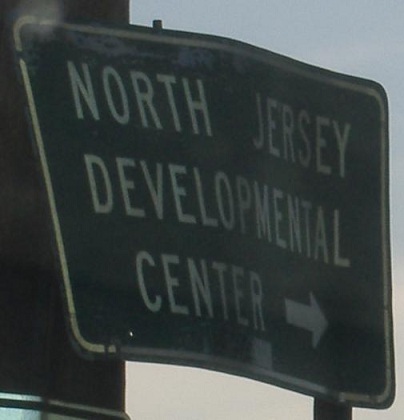 Finally, in 2007, at the tail end of new bridge construction and road improvements between I-80 and US 46, the clearest sign yet appeared that NJ 62 is alive and kicking - an NJ 62 shield from the end of the 46 East ramp! That one's on the US 46 page, but here are some other assorted goodies from NJ 62. Union Blvd. SB south of US 46 (and there are some NB too), I haven't seen these anywhere else in sufficient quantity to suggest it's a county or even town practice. It's just wrong. Union Blvd. NB at Riverview Dr. The interest here is in the first LGS, which has its own luminary. Clearly, there was a much older, nonreflective sign here. I'm willing to bet that way back when this interchange was constructed, NJ S-6 NB had a button-copy sign under here, but reading what I don't know. I also don't know if the light functions anymore. See that last photo up there? Compare it to this older version. 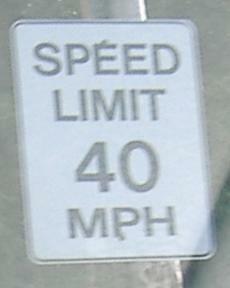 Yes, the US 46 shield was moved next to the I-80 shield. 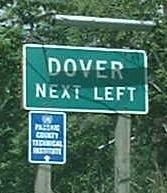 But look at the Dover sign. Is that black on white?? It may just be a badly faded green, but the point is, it's old. 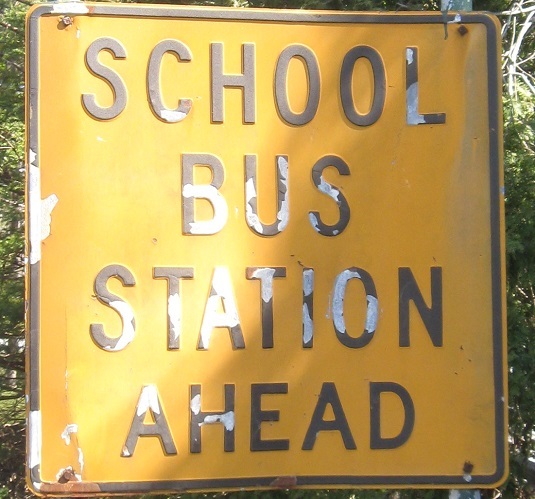 The replacement occurred in July or August, 2004. 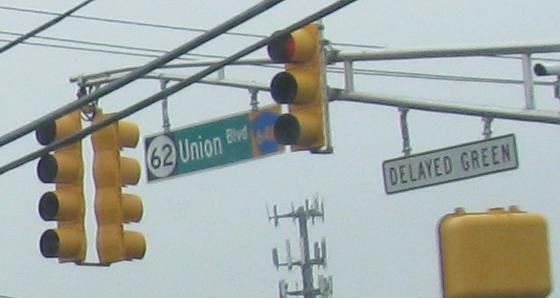 A signal overhead with no other page to go on, NJ 62 is unmasked at Lackawanna Ave. between US 46 and I-80, the only intersection between either end of NJ 62. A U-turn/left-turn jughandle in the northeast quadrant of the intersection is now used for NB-WB and WB-SB movements at the US 46 interchange. This LGS was on Union Blvd. NB, but it's sure not there anymore. Between US 46 and I-80, there are these NB shields. 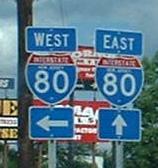 I-80 WB traffic is directed to Furler Street, though it should have used US 46 WB in the first place. Old (especially the first shield) SB signs. 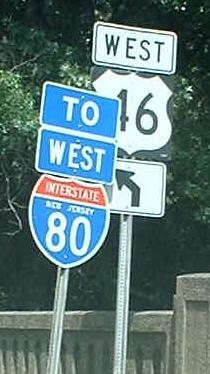 It's possible that NJ 62 was its original length when that advance I-80 shield was erected. 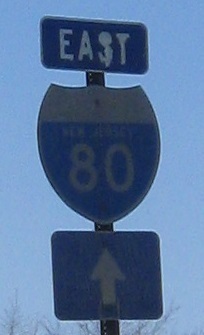 Old curve sign on the SB ramp to I-80 EB. NB on Union Blvd. 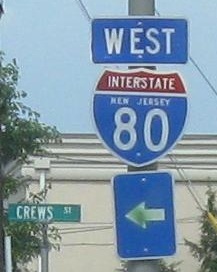 ; Crews St. is a short connector to Totowa Rd., from where Minnisink Rd. 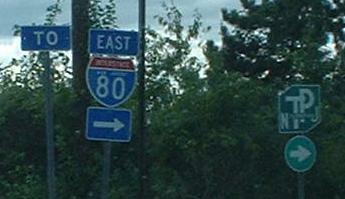 takes traffic to I-80 WB. 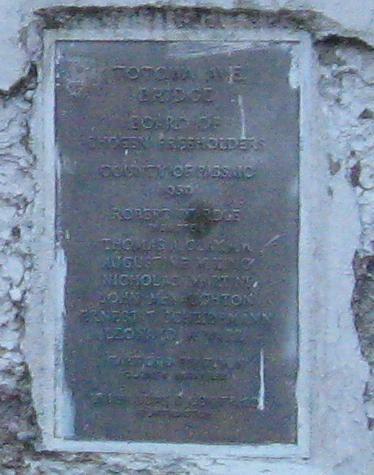 Of course, Furler St. or US 46 would have done the same thing further south. At least there's an embossed sign here. SB, same intersection. The second photo is the old sign that was replaced when I first posted it. 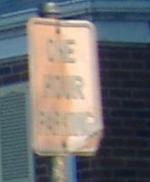 This embossed parking sign probably saw Union Blvd. as a state highway. Not Union Blvd. 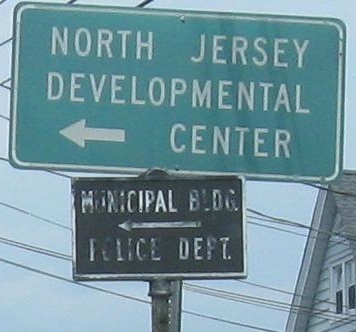 but still original NJ 62 (or at least S-6), Totowa Rd. across Molly Ann Creek in Totowa.